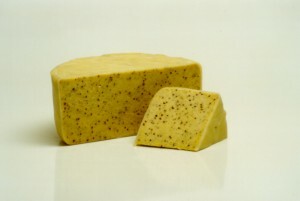 A mature cheddar blended with mustard adn ale to yield a moist, tangy cheese. Y-Fenni takes its name from the Welsh town in which it is made, and a town which is more often referred to as Abergavenny by the English. It is one of the few cheeses made on a larger scale that we sell at The Teddington Cheese. Each cheese is made from mature cheddar cheese blended with whole-grain mustard and Welsh ale. Pasteurised cows' milk is used. The mixture is then pressed firmly into moulds and then coated in a pale yellow wax. It has a full tangy mustard flavour, moist texture, pale-yellow colouring speckled with the mustard grains. Y-Fenni is often enjoyed as part of a ploughman's lunch. Its consistency makes it excellent when melted, and it can be served on toast or even on a steak. Each cheese measures 30cm in diameter, 10cm deep and weighs 3kg. Smaller cheeses are also made.